This initiative with Tuckahoe Common School and the wonderful Nurse Wendy Meyer emerged after considering the AOA report exposing vision impairment as the most common handicap for adolescents. About 8% of children between age 0 and 5, and 25% of children between age 12 and 17 have a visual disorder. That equates to more than 13.5 million children in the US who may not be able to see the whiteboard clearly. At most, only 14% of children get an eye exam before they start school. Likewise, in a study of 5,851 children between 9 and 15, only 10% of the 20% who needed glasses had access to them. 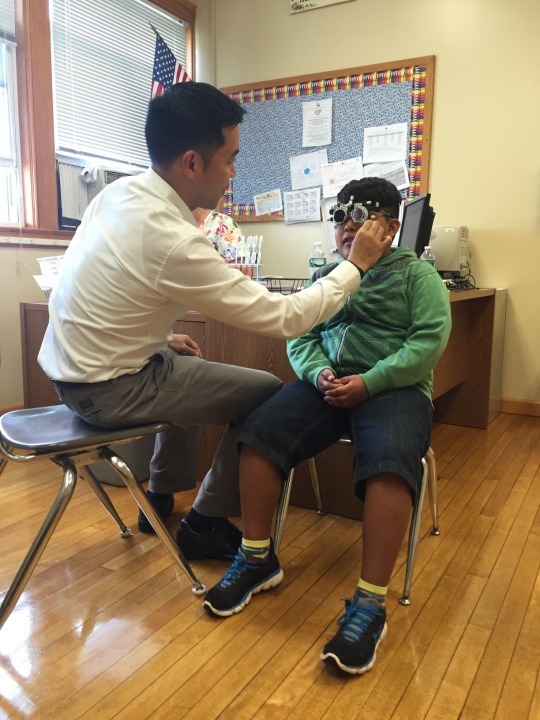 Acknowledging school vision screenings as the best method to quickly identify common visual disorders, our team organized with Tuckahoe Common School to increase accessibility to vision care. Each exam consisted of measuring visual acuity as well as testing for color vision, as state laws require. 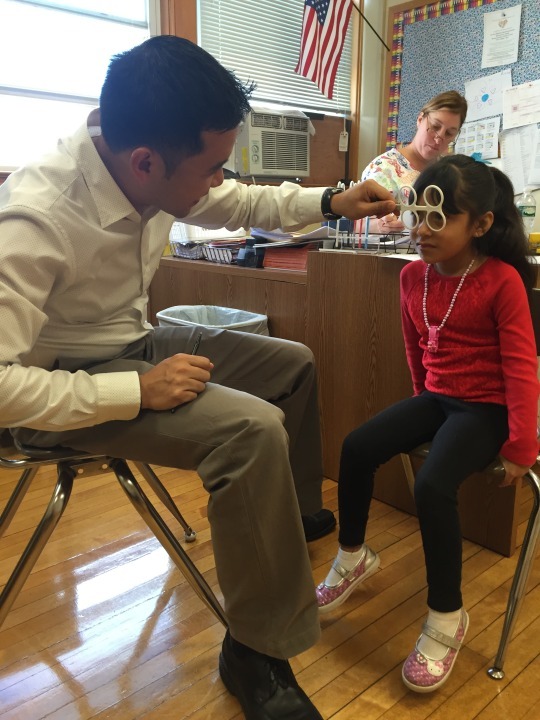 The goal was to bridge the gap between the school nurse’s office and the eye doctor. Often nurses identify students in need of additional care, and a letter is sent home with hopes that parents will follow through with recommendations to see an optometrist. However, this method is not effective. Smart Vision Labs brought the doctor and our smartphone-based technology, the SVOne autorefractor, directly to the school, and were able to provide prescriptions to students whose parents provided consent. This is where the SVOne is key. It can play a major role in closing the gap for students needing glasses. The ease of use of the SVOne, paired with the device’s ability to store refractive data and final prescriptions, speeds and streamlines the process. The school nurse can keep a record of the prescription in the student’s file. If the student breaks or loses their glasses, they can obtain new glasses quickly with a copy of the prescription readily available. This can help optometrists meet the needs of the community and reach more and diverse patients. This model is not limited to just local schools. It can be applied to any organization seeking an on-site vision exam solution. Groups of 5 to 7 students were brought into the nurse’s’ office at a time. While one student was checked for distance visual acuity, the other students were being screened for color deficiency and near visual acuity. This took about 5 minutes per group. Students that failed the screening were invited back for refraction on day 2. Groups of 2-3 returning students were brought into the office at a time. Testing for distance visual acuity, pupillary distance, lensometry, autorefraction with the SVOne and refraction were performed on each student. Prescriptions were then provided for students who required them and referrals for further testing were recommended to the nurse for follow up. Children passing distance visual acuity testing the second time can be due to many factors including nervousness being around other students or now familiarity with the test. Many children also failed the initial screening due to glasses issues such as forgetting them, breaking them or not wanting to wear them because of aesthetics and/or social pressures. Using a ruler instead of a pupillometer to measure pupillary distance also quickened the process and is less intimidating for students. A small waiting area with books and coloring materials outside the nurse’s office was essential. A motivated nurse, in this case Wendy Meyer, is key. Her knowledge of the school and students (e.g. shy, nonverbal, language barriers) was invaluable. Having a liaison at the school who knows the community will help mitigate language barriers and better prepare screening staff before the event. A vision screening is just that, a screening of general visual disorders. Nationally, about 65% of visual disorders amongst adolescents are refractive errors that can be corrected with glasses. The other 35% are binocular vision disorders, dealing with coordination of both eyes. These students must be referred to offices and cannot be accommodated in school screenings. Know a school that would be interested? E-mail maya@smartvisionlabs.com for more information.